Good morning!! 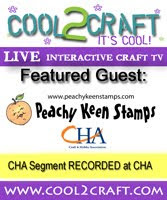 It's time for another fabulous challenge at Peachy Keen Stamps. We have a great sketch to follow, and the design team has come up with all kinds of inspirational creations for you to enjoy. For my card, I used one of the Hillbilly Holler set 2 stamps from Peachy Keen Stamps. I love this little frog. I smile every time I look at those teeth!! "Let's Do Lunch." Yeah RIGHT!!! The DP for this card is from K&Co., and it's actually Halloween paper. I used my label Nestabilities to cut out the frog, and embellishments consist of the wonderful pearl and rhinestone bling, which can be found in the Peachy Keen Stamps store, a button, and some satin ribbon. This week, I'd like to welcome the very talented Irit who is guest designing with us! Her blog, Irit Shalom's Designs is a treasure trove of inspiration, so please drop by for a visit, and leave her some peachy love!! While you're hopping around, be sure check out the Peachy Keen Challenge Blog so that you can see all the fine details of the sketch, and the wonderful samples from our sweet and talented designers. I'm so glad you could stop by today. I wish you a blessed day and lots of happy stamping! Very Cute CArd Lorie--I love the colors and the sentiment! Oh how cute. I love frogs and he's adorable! :) Great elements too. Well done as always, Miss Lorie!!! Oh my goodness!!!! Lorie, this card as TOADally terrific!!!! This creation has put a huge smile on my face that I can't wipe off:) Every element is as perfect as it always is...and your wonderfully colored image keeps me smiling!!! I ♡lov♡e it...A LOT!!! Oh isn't he a cutie!! Love all the greens and fab pearl embie up the side! Great use of Halloween paper...you're so clever! I've been missing you, my sweet friend! I LOVE LOVE your card. Great papers. That frog has so much personality. Great coloring too. As always so inspired Lorie. Just love your blog. How cute is this!!! I love the sentiment...made me chuckle. The pearls and rhinestones are a wonderful embellishement. Sorry I am behind on my commenting. I agree with Viv. That frog looks like he could leap right off the page. Your shading always amazes me! Great card once again! Oh my... I LOVE the frog! Your coloring is just out of this world! I LOVE all the green! It looks AMAZING.. as always so inspiring! If I ever come to CHA... I will be the one who is sitting at the booth watching you all day color!